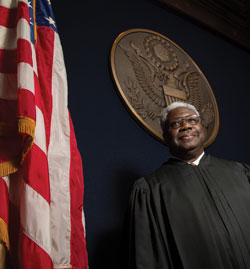 Chief Judge Carl Stewart of the 5th Circuit Court of Appeals in New Orleans is referred to as one of the most influential federal judges in the nation in an ABA Journal article published this month. Judge Stewart is the keynote speaker for the 29th annual Wake Forest Law Black Student Lawyers Association (BLSA) scholarship banquet on Friday, Feb. 28, 2014, which will be held at the Milton Rhodes Art Center in Winston-Salem, N.C.
A native of Louisiana, Judge Stewart is the first African-American chief judge of the 5th Circuit, serves on the federal Judicial Conference, is vice president of American Inns of Court, and chaired the Federal Rules Committee until recently. Photo of Carl Stewart by Kathy Anderson, from the ABA Journal. Read the full article from the ABA Journal. Learn more about the BLSA Banquet.